UPDATE, March 30: I'm now in Japan! My tweeting has slowed down quite a bit, mainly because I am busy ^_^ - but also because the real news has pretty much slowed down. Please check out my personal site for significant behind-the-news type updates that aren't food-related. By the way, life here in Yokohama (which is right near Tokyo, for the geographically challenged) is pretty much close to normal. Kids playing outside in the sun, mom's chatting, people going to work as usual, etc. I guess there is a bit of tension in the air, and lights tend to be dimmed at night, but that's about it. The biggest problem people are griping about right now is the high pollen count. Sorry to disappoint some people who were expecting far worse! As I said before, my family and friends are all ok, (including my mom, who I know has quite a lot of fans via this site) though my stepfather hasn't been able to reach one of his brothers in Aomori as of yesterday update: all family member have been contacted and are safe. I've gotten emails and so on asking specific questions about missing individuals and other thing. I am only a private individual, and I'm pretty much overwhelmed at the moment. I have no power to help you officially. Please use official sources to get information/assistance. For online information, the Google Crisis Response page is a good place to start. I also periodically post pertinent links on the abovementioned Twitter stream. Since many people have asked, I'm putting a list of places to donate. If you have specific questions about donating to a particular organization, please consult their website. I'll update this list as needed. To send in listings for other places to donate, (new request) please post it as a comment to this article, so it will be at least accessible to everyone before I have time to update the page. Money donations are the best way you can help from overseas. At the moment roads are very congested to hard hit areas because of partial closures, etc. Don't try to send goods; they may not even get to victims. Money can always be used to purchase needed items. Finally, for my fellow Americans (and yes, I am a U.S. citizen), just in case you're hesitant for whatever reason about lending your support, please see this report, after Hurricane Katrina. Japanese prove truly "A Friend In Need". I believe this is at least partly why the U.S. Military operation name for the disaster assistance is named Operation Tomadachi. Tomodachi means Friend in Japanese. UPDATE I'm putting any time sensitive fundraising events up at top here. Note the international Red Cross organizations (see below) have set up earmarked funds for Japan. A U.S. nationwide-bakesale taking place on April 2nd. See Bakesale For Japan. Still ongoing auctions to help the victims of the Japanese earthquake and tsunami. Organized by Japanese-American Japanese-American ceramic artist Ayumi Horie. She, Ai Kanazawa Cheung, and Kathryn Pombriant Manzella have mobilized to solicit, promote, and auction handmade pieces of art generously donated by talented artists throughout North America and Japan. Facebook page. 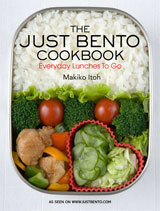 My fellow bento bloggers have set up a fundraising site, See Bento4Japan. Artists Help Japan is a charity movement initiated by Dice Tsutsumi, an art director at Pixar Animation Studios. It gathers together the efforts of artists communities around the world to help raise money for Japan disaster relief. Artists Help Japan. The Japan Society of New York has set up a Japan Earthquake Disaster Relief Fund. Details here. The Japan Society is also doing benefit concerts and more. Check on their web site. The Japan Society of the UK has also set up a Japan Earthquake Disaster Relief Fund. Details here. The JCCCNC has also set up an Earthquake Relief Fund. Details here. You can order a We Pray For Japan wristband via Lady Gaga's official site. You can add money to the $5 price to donate if you wish. Cranes For Japan is an initiative to gather 100,000 paper cranes. For every crane the Bezos Family Foundation will donate $2 towards relief efforts. Wow, this is a very creative way to raise funds. The Society of Typographers is calling for type designers everywhere to contribute a glyph to a special typeset that will be sold to raise funds to be sent directly to organizations in Japan. Info here. A collaborative literary and photographic book, proceeds to go to Japan disaster relief. Quakebook site. Another collaborative literary effort, proceeds going to Japan disaster relief. Write for Tohoku site. Via the American Express donation page listed below, I found this list of Japan related organizations. Even if you don't have an Amex card, you may find it useful to find a local organization. Note that many international organizations are now earmarking funds specifically for Japan's disaster. Both my grandparents on my father's side were Salvation Army officers. I have great faith in this organization. MSF is another great organization. They've already started work in Japan. The Japan Red Cross is taking donations by bank transfer (in Japan) or credit card (in Japan and from overseas) but their site is understandably swamped. Try this link. Otherwise, all international Red Cross offices are accepting donations earmarked for Japan. Other ways to donate - via companies etc. In the U.S., you can text REDCROSS to 90999 with your cellphone to donate $10 to the American Red Cross. Apple iTunes (note: opens iTunes). The Mac App store also has a donate button. In the UK, Japan Centre has set up a system where you can buy donation coupons in 1 pound increments. Link here Donations will go to the Red Cross via the Japanese Embassy. Hilton will match donations up to $250,000 to the International Red Cross/Red Crescent of members donating their Hilton HHonors points. Call 1-800-HHONORS (1-800-446-6677). Hilton is also matching all employee donations. You can donate to support the International Medical Corps' relief efforts in disaster areas everywhere by buying a <a href=http://www.groupon.com/deals/international-medical-corps">Groupon coupon. You can donate via Paypal to one of four charities. Yahoo! News page on organizations to donate to. There's a list of international donation sites at the bottom of this page, which mostly lists places to donate in Japan. If you live in Japan, you can donate food and supplies to Second Harvest Japan. Be sure to read their list! Second Harvest Japan. Also contact your local city/town government offices or look on their web sites - many if not most communities around Japan are now set up to accept donations of goods or volunteers, besides money. If you're in Japan as a visitor, the easiest way to donate is to put cash in the donation boxes at all konbini (convenience store) cash registers, including 7-11, Lawsons, FamilyMart and am/pm. If you're in an unaffected area, also check if government offices or local businesses have donation boxes. Otherwise most if not all Japanese donation methods require a Japanese bank account or cellphone. The page I linked above has many links to donation sites in Japan. Submitted by maki on 2011-03-13 03:26. People can also check out http://english.kyodonews.jp. They update pretty often. Thanks for the heads up on where to donate. I submitted a donation through Amazon. Thanks for posting this. I'm from Hawaii and we watched the coverage closely here. My heart goes out to Japan!! There's also a way to donate through Google (goes to red cross in Japan) http://www.google.com/crisisresponse/japanquake2011.html (donations made in yen only). I’d made plans prior to this to go to Japan in 2 weeks. I’m certainly not cancelling. I'd been wondering about this since the news hit -- glad you're still going and looking forward to your posts there and maybe even a guest post from your mom or other family members. that is so sad to hear, I hope your father will find his brother too. It's great to know you can help with those organisations. Thanks for helping to keep us informed Maki! Thank for doing this. What a terrible tragedy! Our local Japanese community center (Japanese Cultural and Community Center of Northern California) is accepting donations and will send 100% to those in Japan most affected (http://www.jcccnc.org/). My son's preschool (a Japanese bilingual school) is also trying to find a good way to help. We are considering a bake/ sushi sale or connecting with a preschool in the affected areas. Perhaps if you learn of any good mechanisms for school children, you can post? The children know something terrible has happened, but we are trying to help them understand. Donated today to different organizations. Thank you for this information. I know it's not enough - I wish I could go and help with my hands. I pray for Japan and it's people, I'm so glad your family is okay. Japan Centre is now taking donations through their website -- especially helpful if one is going to buy items! It's under "Charity" on the top left, and you can "buy" donation coupons in £1.00 installments. The process is exactly like buying something from the website. @maki, you probably already knew this but I thought I'd post anyway. just found this link. posted to my twitter,Jenif1re to you but i dont know if you saw it. may be interesting to your followers. It is related to radiation. Thank you so much in providing such a comprehensive list - I linked in one of our posts to send people here for more info. Thank you and wishing you safe journeys if you head to Japan! Glad to hear that you and your family are safe! p.s. Japanese Red Cross has begun taking donations as well. Both postal transfer and credit cards are accepted. You mentioned that you had planned to go to Japan in 2 weeks and still plan to go. I also had made plans to visit Tokyo next week and am caught between going and canceling based on concerns from friends and family. I have no family there but friends. I really still want to go. Are you concerned about the nuclear reactors. By the way, I donated to the Japanese Red Cross through Google. I'm glad your family is ok. Thank goodness your family is okay. My family is too. Every time I listen or watch the news and it is about Japan I am ready to burst out crying. My teacher and a few of my friends have been feeling so depressed to hear about this. So Maki-san even with the Nuclear gas situation you are still going? Be careful and I send you my prayers and good luck. Have a safe trip to Japan Maki. I'm so glad to hear all your family members are accounted for. My heart really goes out to those in Japan. If you do go, please be safe and take care of yourself! Our thoughts and prayers are with all the people of Japan (inside or out!) at this terrible time. I read this in my newspaper yesterday. I hope this helps you or your readers. Many cellphone companys are letting their subscribers call/text Japan for free. Here’s the latest updated link with the details for AT&T, Verizon & Sprint subscribers. Hope this helps connect people during this difficult time. Long-time reader, first time commenter. A huge thanks to you, Maki, for tweeting so much of the news -- I've been trying to follow as best I (and my very poor Japanese skills) can manage, but especially during the workday your updates have been something to hold onto. Another link for the list, if you like -- fan communities (see community help_japan on Livejournal -- which the spam filter isn't letting me directly link) are in the process of running a charity auction to raise funds for Japan, with people offering a wide variety of things. I've got a fundraiser page setup through Crowdrise.com. I got fed up with seeing so many different showing up that were "helping" by clicking, posting and reposting things, or honking your horn. Only collected $45 so far, but it's something. Some people seem to be having issues these days with just donating for something, crowdrise has several promotions going on, such as any $16 or $26 donation before March 31st putting the person in a drawing to win an iPod Nano. All donations made through my page go directly to Network for Good, Inc. They've collected over $2,000,000 towards helping Japan in this time of need. The money they receive through my page will be distributed through these many organizations involved in helping Japan right now. ADRA, American Jewish Joint Distribution Committee, American Red Cross, Americares, Amurt, Catholic Relief Services, Convoy of Hope, Direct Relief International, EFCA, GlobalGiving, International Medical Corps, Islamic Relief USA, Lions Club Internaional, Mercy Corps, Operation Blessing Internaional, Operation USA, Salvation Army, Save the Children, Shelterbox, and World Vision. For donations under $25, 95%-$1 will be distributed. For donations over $25, 95%-$2.50 will be distributed. Turns out as I've been typing this, I just got another donation, bringing the total to $71. It'd be great to have my link included in the list, but understand if not since I'm not actually the organization the money is going to. Feeling useless here in California, so I'm trying to do SOMETHING good and helpful! Yesterday I started Anime & Manga Bloggers For Japan to help raise money for relief efforts made by Doctors Without Borders and Shelter Box USA. We've raised over $1200 so far. What we want to do is encourage people to donate because they love uniquely Japanese media, hobbies and other things found only in Japan. Obviously, anyone is welcome to participate through donation or spreading the word. We'd really love it if you posted the link to our fundraiser. Silent & live auction. live music followed by DJ. 100% proceeds to UNICEF - specifically to benefit the Japan Relief Fund. Oops not Second Hunger, but Second Harvest. Their website can be seen at http://www.2hj.org/index.php/eng_home for anyone interested. Silent & live auction. Live music & DJ. 100% proceeds from this event will be donated to UNICEF - specifically to benefit the Japan Relief Fund. Japan Association of Interpreters is looking for volunteer interpreters to help in relief efforts. Volunteer interpreters available to organizations who need them. Starbucks, in addition to donating money, is accepting donations at the registers up to 249.99 USD. I copied this from the facebook group Working and Praying for Japan earthquake victims. We are a group of people inside and outside of Japan who are banding together to do just what the title says. I live in Japan and am a member of the Mito church of Christ. We have set up a way for people to give to the Mito church of Christ in Mito, Ibaraki, Japan. The funds will be used to help those in need during this time! If you are interested in this, you can send money to Park Avenue church of Christ in the US or to Bramalea Church of Christ in Canada. There are also other organizations that I copied and pasted here. We need funds for the purchase and shipment of blankets, heavy sleeping bags, baby formula, feeding bottles, food and water. Would like to work with churches of Christ in Japan. We are based in the Philippines and have worked in disasters in Indonesia, Sri Lanka, Pakistan, Myanmar and Bangladesh. Some of us have met Jonathan Wilson and Paul Nethercott at CPI conferences and other venues. They are highly organized and IN JAPAN. Will likely work in conjunction with CRASH but appears to be its own thing as well. Hi, I am living here in Japan. Ive been here for many years. You seem like a person who really wants to help. please let me know and ill do whatever i can do. the faster things can get back to "normal". I am glad everyone you know is safe. I lived in Iwate for a while, and I still have friends there. When I found out that the tsunami had hit Otsuchi, Kamaishi and Ofunato, my heart was broken- luckily, everyone I know there is accounted for and safe, but these places are destroyed. If there is one thing I learned while I lived in Iwate, however, it's that the people in Japan know how to persevere, and eventually, everything will be alright. There were no real activities in the Netherlands, until now. Also, the Red Cross did not do anything specific for Japan. Information on how to give donations to Girl Scouts in Japan & portion of patch sales will go to GSJ via donation from company to GSUSA. Maybe this will work for the LJ link: community.livejournal.com/help_japan -- just add http:// later. MANY of the Japan or Japanese related organizations in Arizona have formed a committee to respond to the disaster in Japan. We created the website www.AzJapanRelief.com to keep people up to date on how to donate. Please pass along this website - a beautiful pendant will soon be available, currently being created by a local artist, with 100% of profits from the sale going to Japan. It is a pendant with a wave graphic in the background, and the kanji TOMODACHI (friendship) in the foreground. Check our website often. We hope to have this item linked on it next week! Everyone should check with his/her employer before donating to see whether the employer will match charitable donations. I know that not everyone whose company offers this benefit takes advantage of it. It might take some extra steps for you but some companies will double the amount donated. It can really add up if enough people do it. Hi, I am a Japanese artist living in BOSTON. Here is what I am doing to support JAPAN. I created a piece called "Prayers for Japan" and started a "Healing Art Donation Project" for JAPAN REELIEF EFFORTS. "Prayers for Japan" is 8.5x11 giclee print and 100% sales from the profit will be donated to the U.S. Fund for UNICEF (USF) to help children in Japan impacted by the Earthquake and Tsunami. I have also put my prints for sale on etsy site. A portion of all my print sales profit will be donated to benefit JAPAN. I would highly appreciate it, if you could spread the words to anyone you know through twitter, Facebook, e-mail, etc who likes art. P.S. Hello, Maki, if you could include my fund raising project in your listing, I would be so delighted! we just hosted a friendly Japanese Relief fundraising at our home with our friend chef Yuriko and her friend Yuko and other Japanese friend attended by Italians and foreigners living in Rome. The offer has been sent and we are happy to help!